Enviro Equine & Pet is proud to announce a new partnership with world-class equestrian athlete, Mara DePuy, who has signed on as the newest Enviro Equine & Pet Sponsored Rider. The Enviro Equine team is excited to pair with DePuy to ensure the ongoing success and development of her own competition horses as well as the success of her many students. 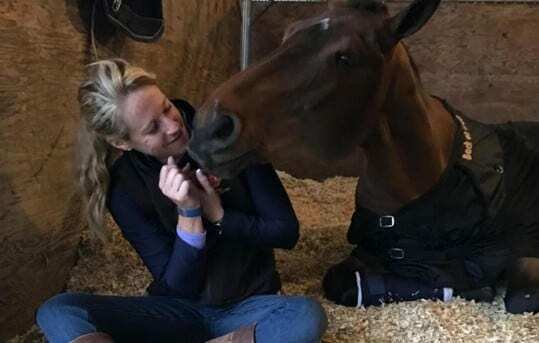 DePuy grew up riding at Huntington Farm in Vermont and spent the summers as a working student for Jane Hamlin, who helped DePuy find a horse named Hopper and suggested that they begin working with Olympian and famed eventing trainer Washington “Wash” Bishop. The pair ended up advancing to the North American Junior & Young Rider Championships in 1993 and continued all the way to the 1996 Olympic Games in Atlanta, where they placed 6th overall. DePuy has ridden in other world-class events such as the Rolex Kentucky 3-Day Event CCI4* and the Red Hills Horse Trials CIC3*, in addition to two appearances at the Pan American Games. DePuy has continued her success with young and quirky horses by bringing Congo Brazzaville C, Here to Stay, Good Stuff, Nicki Henley, High Patriot and Funmaker all to success at the Advanced level. DePuy has found that her niche is based on finding horses early in their event career, forging a strong partnership with them and pursuing the upper levels. She currently has an exciting pair of horses competing, with Congo Brazzaville C leading the string and the exciting young prospect, Wish I Am, proving to be another top contender. When she is not competing, DePuy regularly instructs students out of Willow Bend Farm in Round Hill, Virginia, and also works with horses in “boot camp” for weeks leading up to large competitions. DePuy additionally works with young horses who need training and upper level horses in need of a small tune-up or finishing work. Enviro Equine & Pet produces products for horses and pets out of the finest ingredients. By blending the best of nature and science, Enviro Equine gives your animal what they need to be healthy – every day. Based in Austin, Texas, Enviro Equine & Pet manufactures a complete line of equine supplements and topical solutions as well canine supplements and treats. Enviro Equine & Pet products are free from sugar and GMOs. They help support a healthy inflammatory response, maintain athletic joints, and promote skin and coat health. Try EnviroEquine products and receive 15% off your first online order with promo code PHELPS15!